This lesson can be used as a pre-lesson for the Snap, Crackle, Pop Poetry! lesson plan. Students will be able to identify sensory language in poetry. Display the cover of Are you a Bee? by Judy Allen and ask students what they see (bees). Invite students to turn and talk to their partner to share one thing they already know about bees. Have students share out their prior knowledge while you capture their thinking on a piece of chart paper titled, "Bees" (pay attention to sensory language and underline those words to come back to). Read aloud Are You a Bee? by Judy Allen. 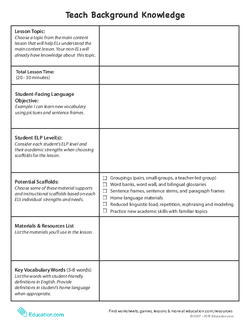 As you read, pause to define new vocabulary words with student-friendly definitions (using the Vocabulary Cards and Glossary as references). When you finish reading, ask students what they learned about bees from the book. Have students turn and talk to share what they learned, using the sentence starter, "I learned ____." 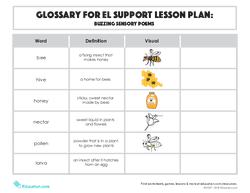 Invite students to share out what they learned, and add new ideas to the "Bees" chart. Highlight the sensory language on the classroom charts (e.g., buzzing, gooey honey, bright flowers) and say, "These are all called describing words. A describing word is one that describes how something might feel, look, smell, or sound. These are also called sensory words. When we think about these words, we can think about them as words that help us describe things or feelings in a way that reminds us of our five senses." Review five senses as needed. Post the prewritten list poem and read it aloud, pointing to each word as you read. Say, "This is a list poem. Did you notice anything special about the way it was written? Was it written like a sentence? A list? Facts?" Have students take 10 seconds to think, then turn and talk to the person next to you to share one thing you noticed. Call on two to three people to share out (if time allows). Then say, "Today we are going to write our own list poems about bees using describing words." Use shared writing to create a list poem about bees with the class, making sure to include the sensory words you underlined on the Bees chart from the previous section. Read the poem with the class echo reading after you. Touch each word as you read to support students. Check for fluency and expression as you read. 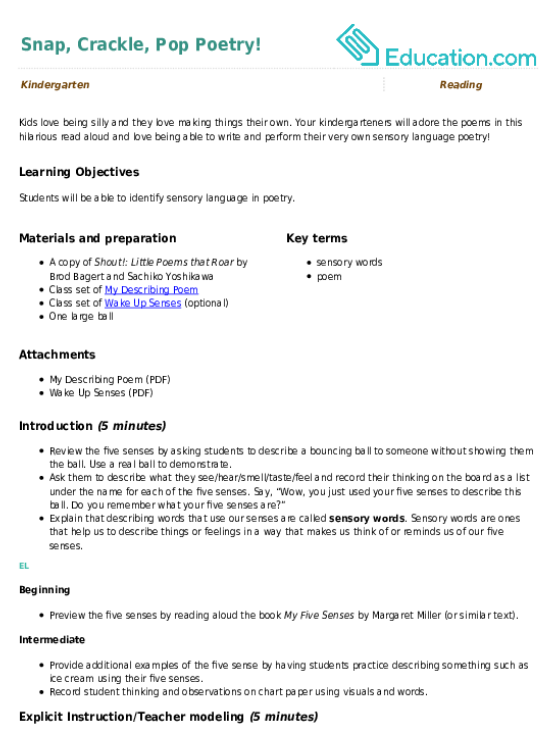 Give directions for individual poem writing by saying, "Now You’ll get a chance to make your own bee poems. Your lines can have one or two words, or you can stretch each line into a few words or a sentence." 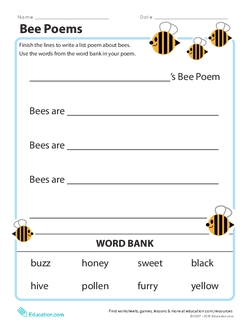 Pass out the Bee Poems worksheets and have students write their own list poems. Encourage students to use the Vocabulary Cards and the class chart with bee words to support them as they work. 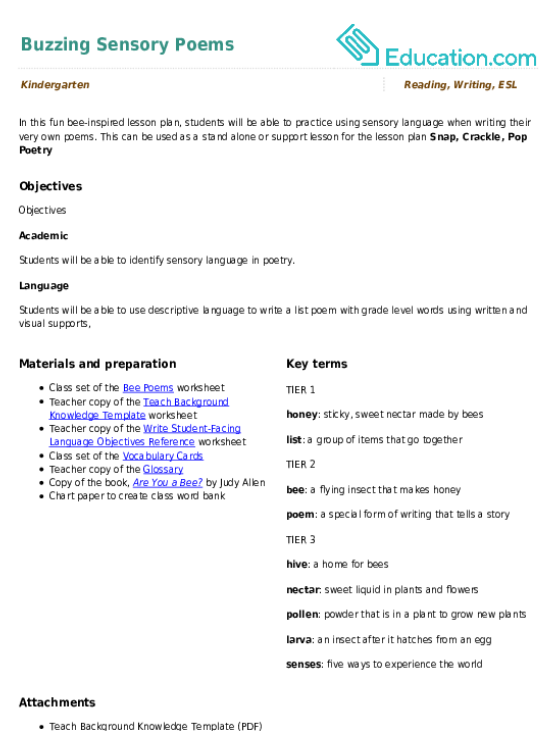 Work with a small group of students to write an additional shared list poem about bees. Have students brainstorm additional sensory words to include in their poem. Encourage students to include longer sentences into each line of their list poem. If time allows, have students create a second list poem about a different topic, continuing to use sensory language. Walk around and check in with individual students about their poems. Assess if students are able to identify and use sensory language in their list poems. Ask students to point to the sensory words they used. Ask students to share their poem with the person next to them. Then collect the poems, and set aside three from previously chosen students to share with the class. Gather the class back together and have the previously chosen students share with the class. 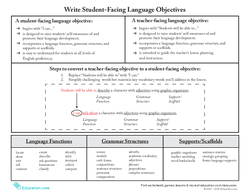 After each student reads their work, allow for one to two questions or comments as time allows. In this fun bee-inspired lesson plan, students will be able to practice using sensory language when writing their very own poems. 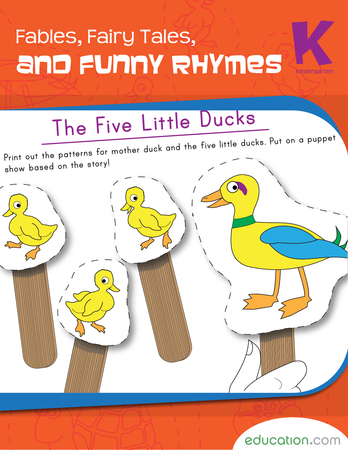 Your kindergarteners will adore the poems in this hilarious read aloud and love being able to write and perform their very own sensory language poetry! Classic children's poems and stories are a wonderful departure for imaginative reflection and thoughtful analysis in this reading comprehension and fluency workbook. Circle the rhyming words in this timeless poem by Jane Taylor.